Mahindra is familiar with chopping the boot of its cars and having tasted first blood with the Quanto, the guillotine now falls on the Verito sedan. Mahindra chopped the boot but not fully, made the sedan look like a hatchback, added some Christmas tree tail-lights and called it the Sporty Vibe! The Vibe is a compact sedan but Mahindra thought it would be better if the look varied from cars like the Indigo CS, Honda Amaze, Swift Dzire and the like. Hence the look is that of a hatchback, but the essential DNA is that of a compact sedan. One thing you cannot complain in the Verito Vibe is the lack of space. It’s got acres of it. The rear seat is large enough for three people and it’s got enough leg and headroom.The centre console comes with a faux carbon-fibre finish, the steering wheel cannot be adjusted for reach or height and the AC and the audio controls on the centre console cannot be operated without taking your eyes of the road ahead. Even on this top-end variant only a driver’s side airbag is offered as a safety feature. The car has a 330-litre boot space, but the loading area is high and the aperture small to load the luggage.The Vibe comes powered by a tried and tested 1.5-litre diesel mill from Renault. On paper it produces 64bhp and 160Nm of torque and that is enough power to get you around the city and on highways. Mahindra says that it has infact tuned the engine for efficiency and we all know how efficient the Renault engine is. This is a car that was designed to be a sedan and any kind of chopping must have required some mammoth engineering skills. So while the manufacturer itself is calling the Verito Vibe a shortened sedan, debate is open on whether you’d like to look at it that way or just think of it as a hatch instead. We prefer the latter.There isn’t any change from the Verito sedan as far as the front half of the car is concerned – it still has that very distinctive boxy front though the new grille and the recent upgrades the sedan got have given it a much sportier visual cue than before. Where the Verito ends and the Vibe begins is in fact from the C-pillar rearwards. The rear windscreen slopes back heavily and is flanked on either side by two vertically stacked tail lamps that the designers at Volvo will definitely recognise and be proud of. The details are what are most impressive and that is evident in each element of that tail lamp cluster as well – right from the high-mounted indicators to the brake lights. Now all that is typical hatchback styling, but where the debate begins is when you take a look at the Verito Vibe’s boot lid. Adapting the Verito to a sub-4 metre length has meant that the rear windscreen remains fixed quite unlike any hatchback we have seen in recent times. Pop open the boot through the remote release beside the driver’s seat and the tailgate swings upward much like a sedan – without the rear windscreen attached. With the parcel tray fixed in place as well, there is no access to the Verito Vibe’s boot from the passenger compartment – again like a sedan. Whether or not the tiny lip of the bootlid qualifies the Verito Vibe to call itself a small sedan is something you’ve got to decide for yourself, but like we mentioned, we’d much rather keep things simple and still call it a hatchback. The biggest upgrade in the cosmetic department that the Vibe gets over the sedan though is in the alloy wheel design that is available with the top end D6 variant which seems like its been picked straight off an expensive accessories list. All in all, the Verito Vibe isn’t the sort of car that will really tickle everyone’s styling tastebuds, but it does look good from certain angles – very reminiscent of 90s hatchbacks which isn’t really a bad thing. It may not have the curves, but thanks to that rear end treatment it sure has the visual muscle to carry off pretty decent road presence. Then there are also small details like the blackened headlamp treatment that lend a lot of character to the car as well. Much like the shortened sedan versus hatchback argument, whether or not the Verito Vibe is a decently good looking car or not is left up to individual judgement. What the Verito Vibe lacks on the styling front, it more than makes up in terms of practicality. With interiors being a straight lift from its sedan sibling, the Vibe is probably one of the most spacious cars in its class. Even with the front seats accommodating full grown adults, there is a whole lot of leg room for the ones on the back bench. That’s not all, the rear bench can in fact seat three adults comfortably and the bench itself is adequately plush as well. Despite the sloping rear windscreen, headroom shouldn’t be a problem for taller occupants either. The Verito may have shed its length but the boot is still pretty cavernous. The only thing that may end up being a cause for re-consideration is loading and unloading capability into the Vibe’s boot. With the rear windscreen fixed, it gives the impression of a rather tiny access port to the boot – though we will try fitting in a big suitcase to really test accessibility when we get our hands on the car for a complete road test later. The Verito Vibe’s brochure does specify the capacity in the trunk as 330 litres which is pretty decent on paper. Mahindra continues to use Renault’s K9K engine on the Verito Vibe as well. This is a 1.5-litre diesel engine that is bought from Renault and there is a Renault mentioned on the engine cover. This is the most detuned version of this K9K engine and it churns out 64bhp of power and 160Nm of peak torque. This might not sound sufficient to you, but in the real world it does the job. The NVH levels aren’t that great, as the diesel clatter is loud and even the insulation inside the cabin isn’t that impressive. There is no turbo lag from this oil burner and the power delivery is linear like a petrol motor. The engine is absolutely a gem to drive in the city, as it doesn’t hesitate to pull even at low engine revs. The transmission is a five-speed manual and this box isn’t that rubbery. The Logan had decent shifts, and the same gear lever and knob is carried forward on the Verito and the Verito Vibe too. The Verito Vibe returned us a fuel efficiency of about 16km/l in a mix of city and highway driving.Again, the Vibe feels very similar to the Verito. Power comes from the same Renault 1.5-litre K9K engine that produces 65PS and 160Nm of torque. Drivability never gets exciting, but the car offers great low-down pull with hardly any lag and an adequate but progressive power delivery. The clutch is one of the lightest we have experienced in a diesel but the heavy steering will take some getting used to. Neither the steering wheel nor the driver’s seat get height adjustability, but the driving position is comfortable and this is an easy and effortless car to drive in city. Mahindra likes to describe the Vibe as sporty but it absolutely isn’t. It rides well and is a natural and safe-feeling handler, but there’s absolutely no sportiness in this package.Check for low interest car loans on Mahindra Verito Vibe in Fincarz. French vehicles are known for their pliant ride and the Verito Vibe gets the same under-pinnings of the Logan. The ride suppleness is good as the dampers do a fine job of soaking up the bumps and road shocks. The ride gets a bit choppy at high speeds, which wasn’t the case with the Logan ever.The handling of the Verito Vibe is decent. It isn’t built to be driven around a track, neither does it have the power to set a competitive lap time about Nurburgring. It has been built to carry people in comfort from point A to point B and that’s what it does perfectly. The steering wheel is surprisingly heavy at low speeds and it lightens up as you gather momentum. Now, generally it is the other way round. Mahindra Verito Vibe On-Road Price in Pune ranges from 7,32,621 to 8,36,551 for variants Verito Vibe D2 and Verito Vibe D6 ABS respectively. 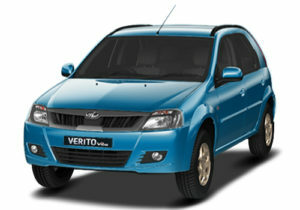 Mahindra Verito Vibe is available in 3 variants and 7 colours. Below are details of Mahindra Verito Vibe variants price in Pune. Check for Verito Vibe price in Pune at Autozhop. Mahindra Verito Vibe is a low maintenance – high mileage car and is a perfect option for regular usage in all Indian families. The car presents an optimum combination of robustness, performance, comfort, and mileage which are basic needs of regular car buyers. Through its sophisticated comfort features, unique design, competitive price, and great mileage, this compact sedan carries all potential to give you best value for your money. Competitive pricing and above average engine performance are some of the main reasons that make this car stand apart from its major competitors. Though Mahindra is a new player in sedan segment, but the brand in itself is a symbol of reliability and trust among Indian consumers. So, Verito Vibe can be trusted in terms of quality, features, and after sales service.